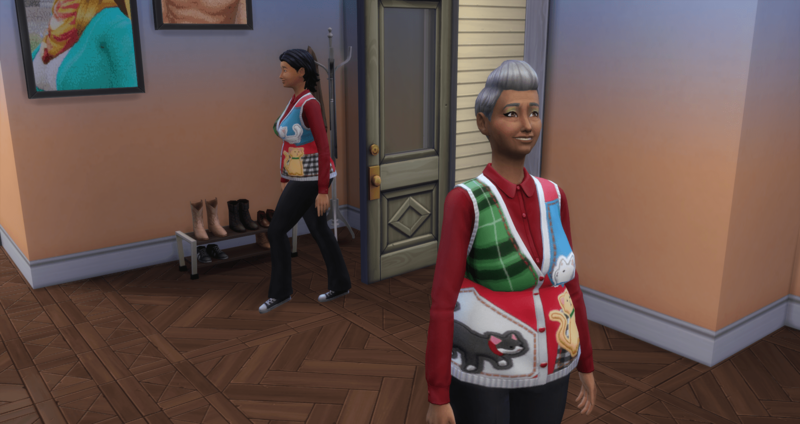 With the house all to herself, it is time for Ilia to begin her contribution to the legacy. 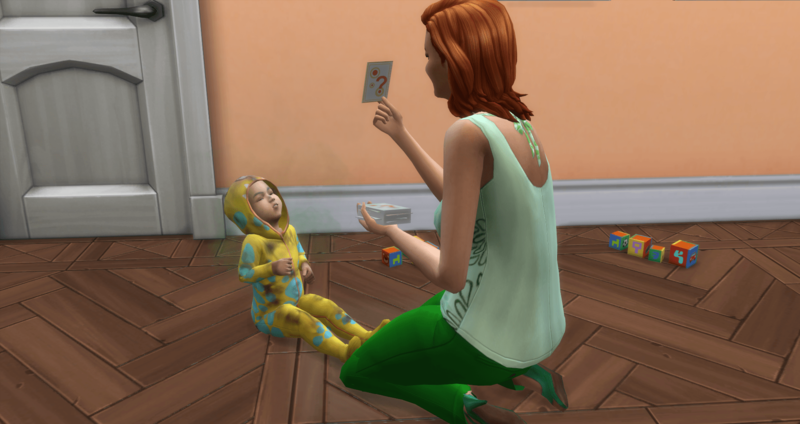 She will be tackling the 7-toddler challenge within the legacy framework. She defers taking a job initially, and instead heads off to adopt her 1st infant. Once she gets back with Hunter, she hires a nanny and heads back to social services. She then adopts Isaac, James, Kevin, Logan, Jacklyn, and Kaitlyn. 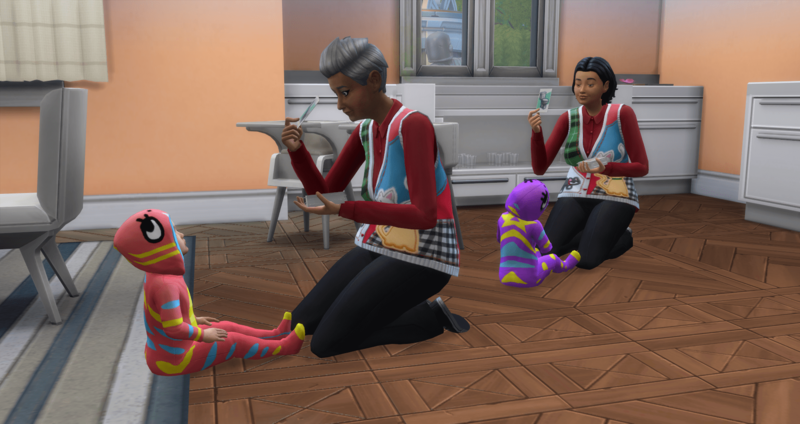 With all of the infants in the house, she takes a quick nap while the nanny handles feeding and changing the screaming infants. Speaking of the nanny, while she was away adopting Logan, the nanny went home. When she came home, she called and hired another nanny. At this point, the original nanny came back so she had two nannies hanging around the house. Not going to complain at this point. On the day of the infants birthday, she takes a quick pee and then begins the process of aging each nooboo up, in alphabetical order. 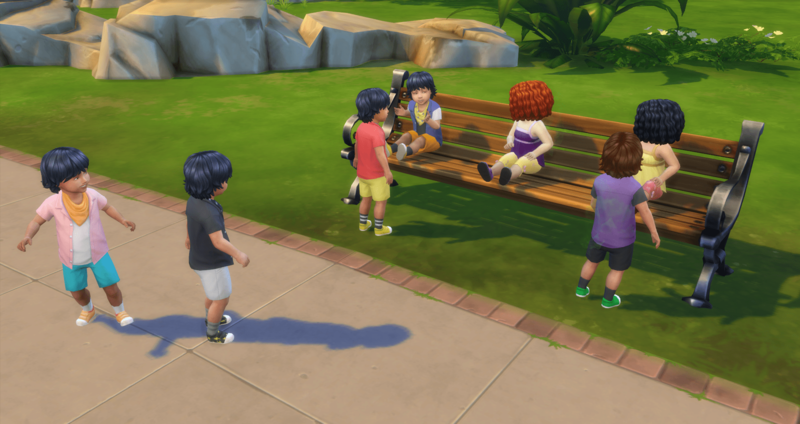 Each new toddler queues up interactions to meet new siblings for however many infants are remaining. As the first Hunter wanted to meet six new siblings. 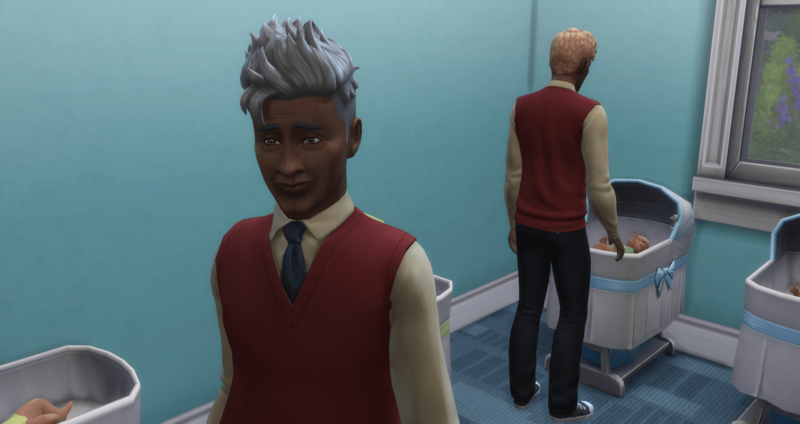 So he ended up just watching the aging process. Once everyone is done with birthdays, they chill on the couches to gather their strength. For the most part, the boys are all fairly identical. 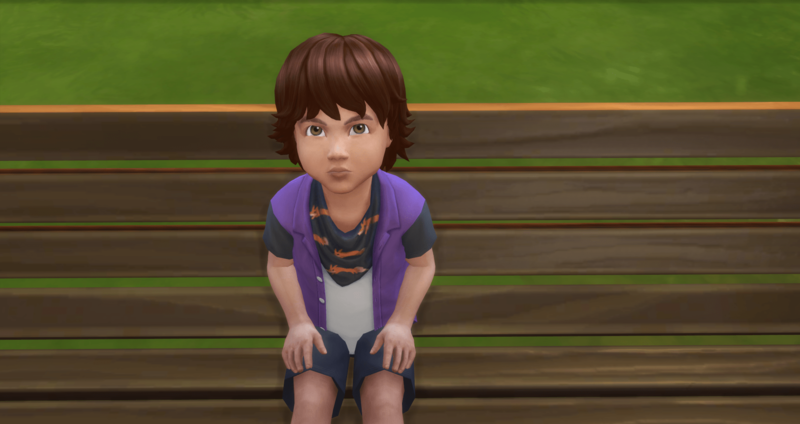 James has brown hair which sets him off from the other boys; while Kaitlyn has red hair which differentiates her from Jacklyn. 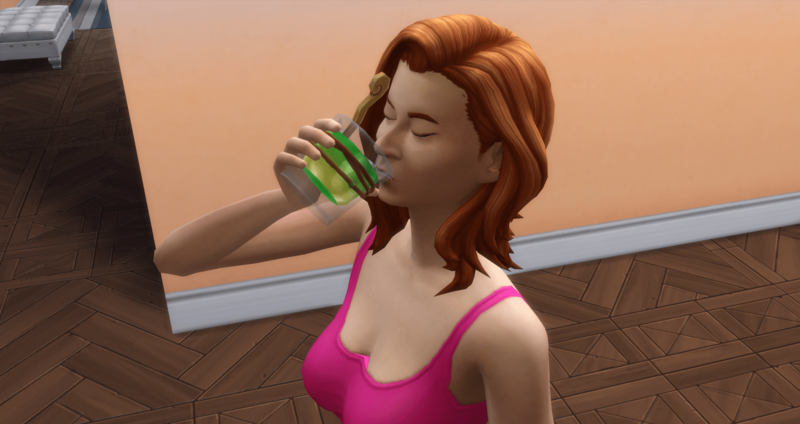 Ilia downs a moodlet potion and begins potty training. It is a challenge to keep plates of food available since they spoil so quickly. But somehow dinner is served and eaten and the first day comes to a quiet end. The first toddler to pass out is James. And the first temper tantrum is Kaitlyn. At one point, I am counting kids – common if you are a parent, even when you only have one or two – and I realize Kevin is missing. He has the need to potty, but isn’t on any of the potties. 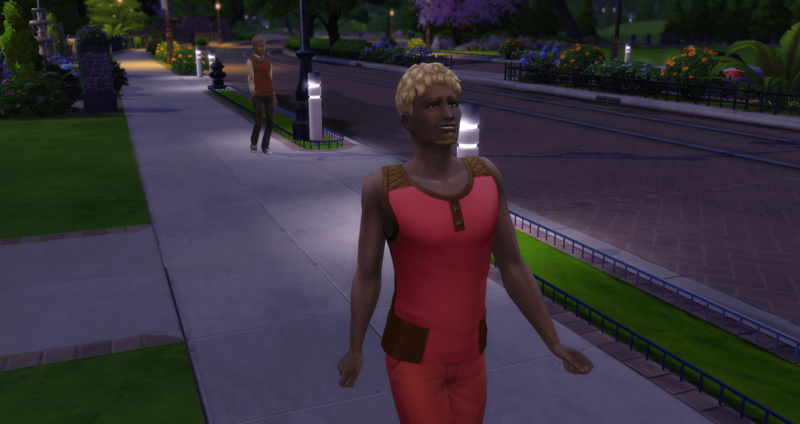 I click on him and find him on the other side of the neighborhood with one of the nannies. No clue why he is all the way over there. I send him home and it takes forever to get him home – hungry, tired, stinky. It takes him a full day to recover back to all greens. The nannies never sleep but will sometimes take a shower. They never leave. I am not sure I want that bill. The family spends the evening watching TV (imagination) and talking (communication), which also helps build relationships. Finally, the nannies both call it done, and head off somewhere. They were at the house for three days. Tag, the new set of nannies show up. I did not order more nannies. They just showed up as the first set left. James asks the new nanny for either a hug or to be picked up. He is turned down. Kaitlyn and Kevin chilling on the bench in the kitchen. Flash cards to work on that thinking skill. Unless they are potty training, there is no direction from me, so they are sort of free to do what they want. Between Ilia and the two nannies, they are able to keep up with the feeding, bathing, training, and playing of the toddlers. Almost. There were numerous messages about starving toddlers, but none were taken away. There is a lot of dancing, a lot of potty training, and a lot of baths. The toddlers mostly feed themselves as the high chair dance is irritating – put them in, take them out, put them in, take them out – especially when they never get around to feeding them. Once the toddlers have all mastered the potty (level 3), it is time for a walkabout. They all head over to the bench on the other side of the neighborhood. Then they get to turn around and go home. Except for fussy and clingy. They call for someone to come get them. 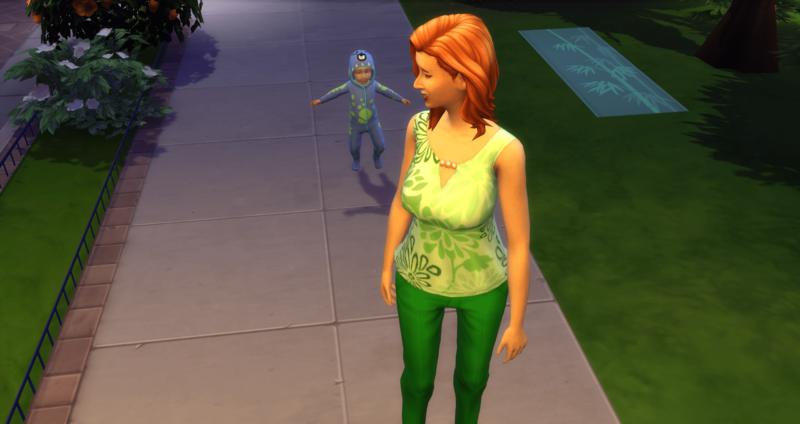 One of the nannies and Ilia head over to the bench, pick up the toddler, set them on the ground, and head back home. Now, the last two toddlers head home. This is apparently a common theme. 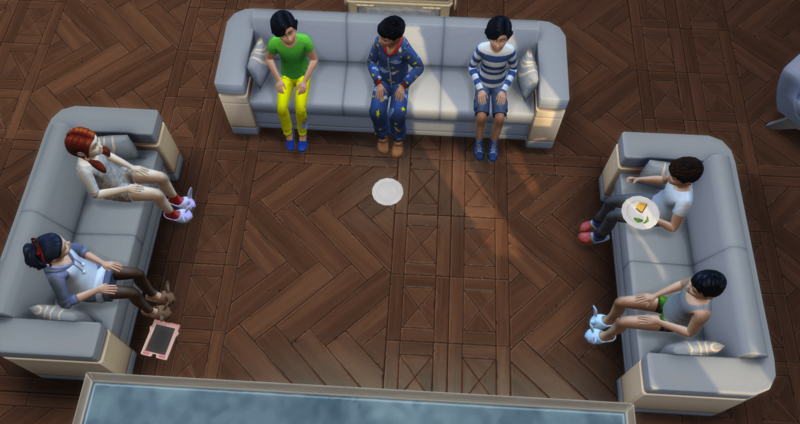 They wake up, really need to potty, but will sit in bed calling for Ilia or a nanny to pick them up and take them to the potty. And, we have runners. 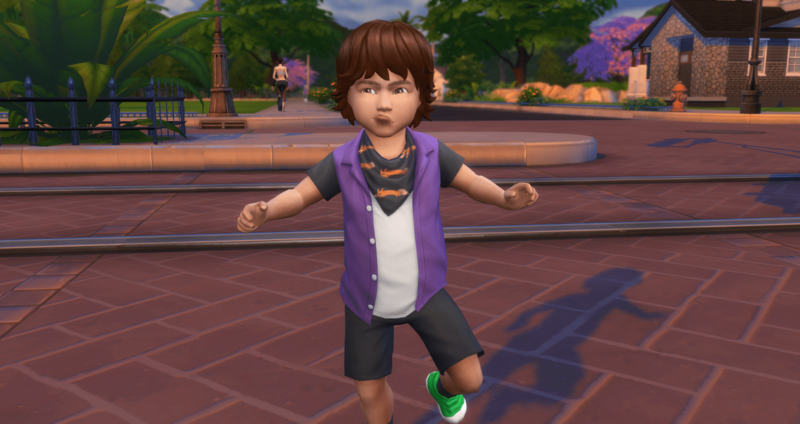 I love level 4 movement – all the little mice, I mean toddlers, scurrying around the house. 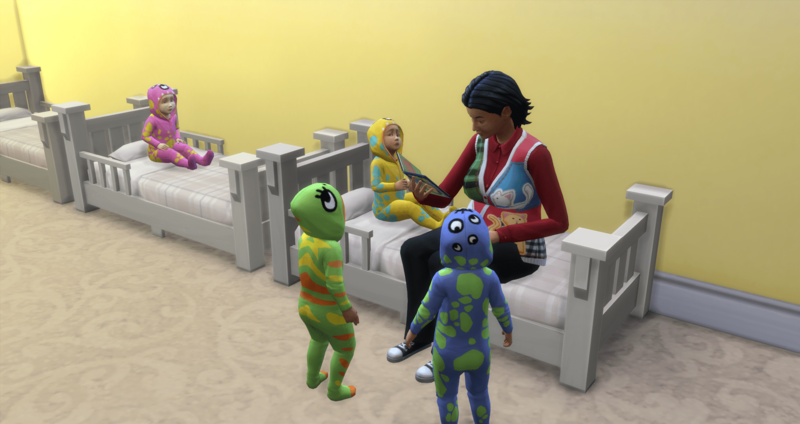 The toddlers will run out to hug Ilia when she gets home from work; but by the time they get there, they have forgotten what they wanted. Someone needs a bath and to find her clothes. Kaitlyn finally gets Ariella to give her a bath. 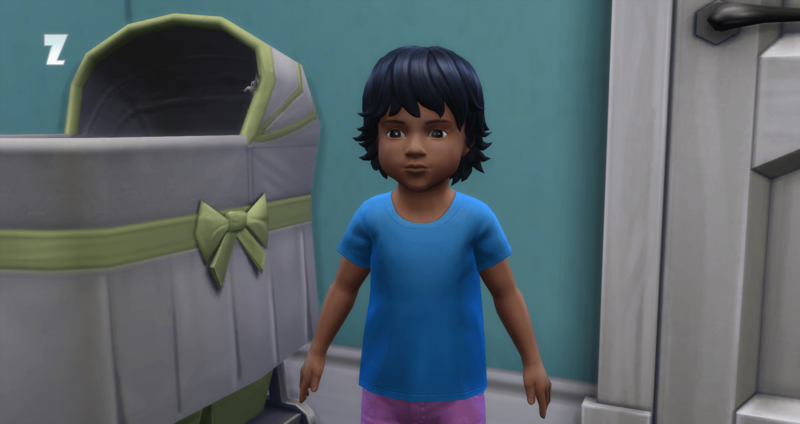 There is a concerted focus on building level 3 thinking skills in all toddlers and getting the remainder of skills to level 3 where they are still lacking. The last level 3 is achieved as they near their birthday – 0 days but before the sparkling age bar. 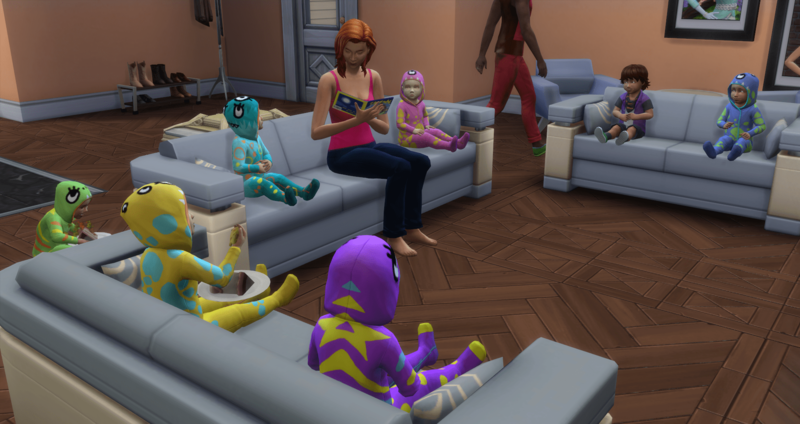 We have seven Happy Toddlers! With that, the toddlers are allowed to free-range for the remainder of their time. They are all Good Friends with Ilia and Friends/Good Friends with each other. I have no red relationships this time around. 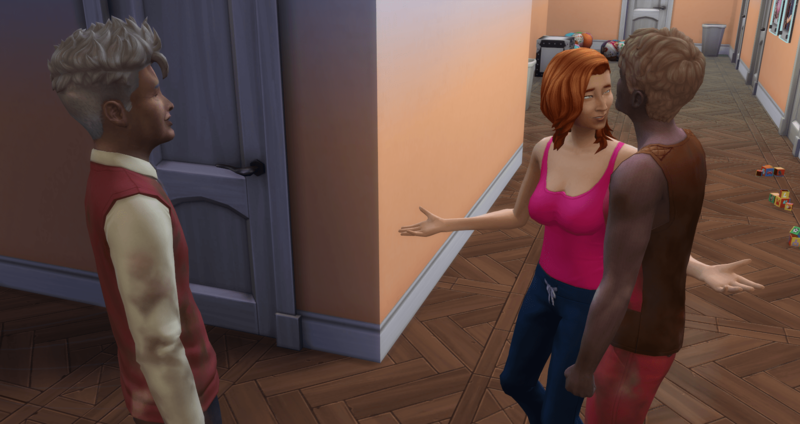 It really helps to have two full-time nannies, a maid, a mom, and random strangers that drop by. One stranger stayed a full day using flashcards on the toddlers before she escaped. 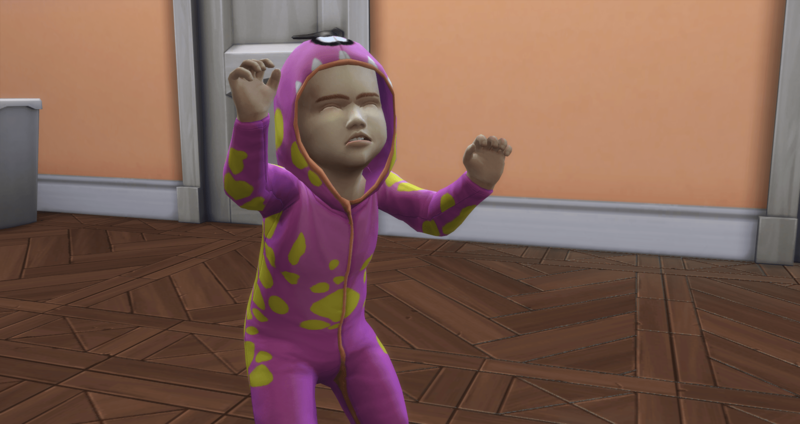 Seven toddlers is hard, even with three adults. Here are random pictures, with captions, from their activities. 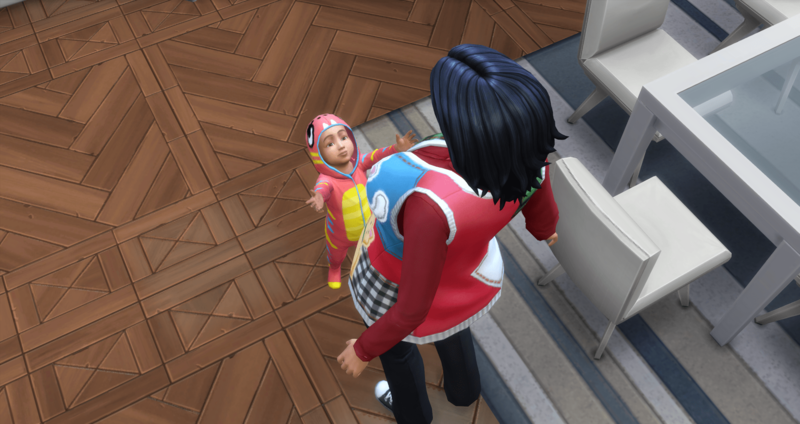 With the toddlers becoming children, it is time to meet them. Voting is going to be available on the Boolprop forums. The poll will run from childhood (now) to their young adult birthday – so 26 game days. What do you mean, you can’t see what they look like from this angle?